Whoah! That is amazing-it actually looks like a giant, silver gorilla! And completely constructed out of coat hangers! Did he use glue? Or tape? Anything? That is so cool! I wonder how long it took to make it. However long, I bet it took a lot of coat hangers. That's one of the best things I've ever seen. I like partly it because the idea is cool, but mostly because it's also executed so well. 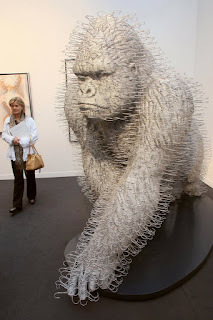 It's high quality sculpture that just happens to be made out of coat hangers. The motion combined with expression win me over.